With so few “concrete” victories since the wave of student uprisings swept California in the fall of 2009, it’s a pleasure to stop for a moment, open up a beer, and say it: we won. For the second time, a “study-in” occupation at the UC Berkeley Anthropology Library has yielded measurable—and surprisingly swift—results. I’d like to think for a moment about what it means to say, “we won,” whether or not we actually did “win,” and what this means going forward, but first, the background on the library occupation. A much-loved and well-used library on the southeast corner of campus, the George and Mary Foster Anthropology Library was the first to suffer the disastrous consequences of a university policy that aims to eliminate 20-30 library staff positions over the next two to three years via a process of attrition. When the Anthropology Library’s only permanent staffer left his position over winter break, no interviews were set up to replace him. As a result, that library’s head librarian—herself in an interim position since 2009—had no choice but to sever the library’s hours by nearly 50 percent. As of today, the library has returned to its Fall 2011 schedule. Faculty from the Anthropology Department have agreed to staff the library until a student can be found for a temporary position, and interviews for a permanent staff member will begin within 30 days. Moving in last Thursday, the occupiers of the Anthropology Library threatened to extend their occupation until their demands were met and the library hours were restored with full staffing, and this was accomplished in just two nights, or about 50 hours of occupation. This is not an unprecedented success: two years ago, the Anthropology Library was occupied after its Saturday hours had been eliminated, and in less than a week, the library hours were restored. One lesson we may take from this is that direct action works. In fact, in the case of the Anthropology Library, it has consistently worked. And we should take this moment to celebrate the significant manner in which direct action has restored part of the basic functioning of the university and—at least in this one case—reversed the terribly damaging policy of an increasingly profit-oriented administration. But moving forward, we should be weary of overstating our success in the Anthropology Library. I write this from a re-opened library in its restored hours. One banner remains, hanging from a balcony outside until the rain stops and the department chair deems it “safe” enough to recover it. Twice now, we have made the extraordinarily reasonable student demands of keeping the library open, and twice now, we have achieved these demands—at the expense of the long-term indefinite occupation (or in 2009, a rolling, recurring occupation). In short, this occupation is as much of a success as we allow it to be. In 2009, restoring the libraries' hours meant the end of the library occupations, but the library “study-in” model became enormously successful in its own right, being reproduced across the state on countless occasions. 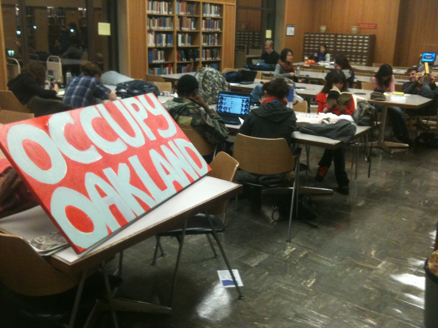 On the UC Berkeley campus, the library occupations took a pause, but the success bolstered organizing on campus for the November 20, 2009, occupation of Wheeler Hall—the largest and best-remembered event on campus in recent memory. In 2009 we had no “Occupy”—we were, for a time, alone in that game. We were the California occupationists, the crazies at the marches with the U-locks in our backpacks and the “Occupy Everything” banner overhead. Winning at the library, at that moment, was cause for escalation. It confirmed for us the effectiveness of our tactics and reminded us to keep moving, keep organizing, and to keep taking what was already ours, returning and reshaping public space for the public. This victory is only a victory if we use it as a springboard for further escalation and further growth. The policy we’re witnessing at the libraries is symptomatic of a larger shift at the university towards temporary, underpaid, and underemployed labor, which in turn reflects changes beyond the university as well. We must make these connections, and recognize that what it is at stake is, yes, the library, but it’s also the university, the public space, and the terms of our own subsistence. If we fight only for policies, then we have already failed. Can you clarify what you mean by "the library occupations have earned us our only concrete, measurable successes"? Is "us" UC Berkeley? I disagree with all the flowery rhetoric about "greatest successes". What I've learned is that concrete achievable demands bring Others to the table and get stuff done. While high-flying symbolic calls for changed to society & mass resignations just make us look like irrelevant loonies.